Richard talks to Brian on the big telephone. Ben: "Check your emails bosco." In a text message from England giving out that I haven't checked my mail for a while. Last week I found myself at the Slovakian Embassy in Ballsbridge for a barbeque. Richard is friendly with the staff there and was in a position to invite me to the bash. I invited Brian and Mairead, much to Richard's amusement. "You're such a socialite," he laughed. When we got to the Embassy we were looking in thinking "doesn't look like there's a party on here." We couldn't get Richard on the phone so we followed a guy around the back and lo and behold there was a fine barbeque serving the most divine Czech and Slovakian food. And as for the beer! Budvar and my favourite in the Porter House, Pilsner Urquel. 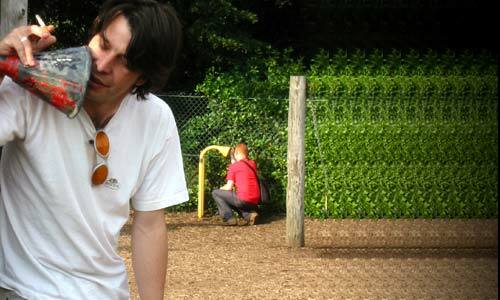 After that we went to a playground nearby where meself and Brian relived our youth. Then we sat outside Mary Mac's for one before retiring to a nice restaurant nearby. That's right, a quarter of a century has passed in front of these eyes, and to celebrate I am hosting a lavish party at Waltzer Lounge on Saturday August 3rd. If you know where it is, come along. There will be the usual fun and games, and a few surprises! Not only that, but I will be in town on Thursday night (25th) if you are on to come in, Pravda on Liffey Street, just north of the Ha'penny Bridge. I keep promising you photos from the little party Mandy had a few weeks ago, but I wanted to use the pictures of Ballsbridge and Molly's birthday this week. Hopefully next week will be so boring that I don't take any photos and I'll use the ones from Mandy's. They are actually quite good too!